Soap Maker: manufactured soap. European soap manufactured after the 16th century was made from vegetable oils rather than animal fats. Soaper: alternative name for a Soap Maker. Sojourner: traveller, travelling merchant or vagrant. Sojourner Clothier: a travelling merchant selling clothing. Soldier: member of the land based armed forces. Sole Cutter: made the soles for boots and shoes by cutting the leather. Solid Iron Grinder: alternate term for a Sad Iron Grinder, who worked on the manufacture of sad irons, which were also known as solid irons. See Sad Iron Grinder for further details. Sondesman: alternative name for a Sandesman, who was a messenger, ambassador or envoy. Soper: made soap, probably by boiling vegetable oil rather than animal fat. Soyor: probable misspelling of Sawyer. Spade Tree Maker: alternate term for a Spade Tree Turner, who made wooden spade handles on a lathe. Spade Tree Turner: turned wooden handles on a lathe. The handles were subsequently fitted with a metal spade head and used for digging. Spallier: low ranking job in a tin works. Spectioner: worked on a whaling boat. Spelterman: Sometimes referred to in census and other records as a Spelter Labourer, or Spelter Worker. Spelter itself is an old term for zinc. Working very long hours in unpleasant and potentially toxic conditions, the worker smelted zinc. You may come across this old occupational title if you have ancestors from the areas around Bristol or Swansea, which were centres for zinc smelting. Sperviter: the medieval term for a keeper of sparrow-hawks. In later times, may have been used as a sparrow keeper or bird keeper. Spindle and Fly Maker: made spinning machine components. Spinner: worked in the textile industry, spinning yarn. Spinster: an unmarried woman or girl of marriageable age. Derives from the original meaning of a woman who span wool at home for a living, thereby living independently of a man. Spirit Merchant: sold wines and spirits. Spit Boy: a kitchen worker, who turned spits in the fireplace to rotate food so that it cooked evenly. Spittleman: hospital attendant or Porter. Splitter: a woodcutter or stonecutter. 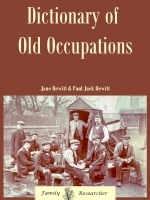 A handy reference ebook for family tree researchers, creative writers and history buffs. Jane is an experienced, professional genealogist. Aided by her husband, Jane compiled the Dictionary of Old Occupations over several years. This A-Z is an informative and fascinating read, giving insight into the day to day experiences of real people from all walks of life over many centuries. Available in Kindle and all other formats. Also available in the US.